Figure 8 Hierarchical value map of negative ladders of the regular consumers. This dissertation seeks to analyze the motivations and barriers regarding organic food and the relationships between attitudes, purchase intentions and purchase behavior. On the basis of results from a survey conducted with a German sample, it is found that women buy more organic food than men. By analyzing participants’ attitudes, the study reveals that women think that organic food is in fashion and they value the satisfaction they get from organic food. Participants’ intentions reveal that natural content but also altruistic reasons such as animal welfare and environmental protection count. Participants show a high indifference toward organic food but price seems not to be a barrier. The image of organic food and its appearance as barriers affect intentions to buy the most. A factor analysis and a subsequent correlation analysis reveal that attitudes, purchase intentions and purchase behavior are intercorrelated. The mediation hypothesis saying that intention is a mediator between attitude and purchase behavior cannot be confirmed. Economic implications and future research are discussed. Regarding the production and certification of organic food, the European Union (EU) sets “very strict limits on chemical synthetic pesticide and synthetic fertilizer use, livestock antibiotics, food additives [such as flavor enhancers, artificial aromas and colorants], and processing aids and other inputs” (European Commission, 2014, para. 3). Since 2010, every pre-packaged organic product must carry the organic logo of the EU. This logo for organic certification in the EU can be accompanied by other private or national logos (Willer & Lernoud, 2014). In 2001, the German national organic label had been introduced, beside the already existing private organic labels in Germany. The introduction of the national organic label contributes to the trust of consumers in organic food products and a better reputation leading to a reduction in misleading labeling and unfair competition. Still, the organic regulations and their transparency are continuously improved (Federation of the Organic Food Industry, n.d., para. 6). The Eco-regulation of the EU not only specifies that organic food has to be processed in a way that synthetic pesticides and synthetic fertilizers are not used, but it also regulates that organic farming includes wide crop rotation and enhancement of soil fertility, responsible use of energy and natural resources, maintenance of biodiversity, increase of livestock in free-range and the improvement of specific behavioral needs of animals (European Commission, 2014, para. 3–6). In order to give organic certification, the Eco-regulation of the EU specifies that organic food products must contain at least 95 % organic ingredients and can contain at most 0.9 % of genetically modified ingredients (European Commission, 2010). Similarly to the organic logo of the EU, organic food certified with the German national organic label must contain at least 95 % organic ingredients, whereas the remaining 5 % can only be of conventional ingredients if certain ingredients cannot be found organically produced. Organic products certified with the national German organic label must not contain any genetically modified ingredients at all (Federal Ministry for Alimentation, Agriculture and Consumer Protection of Germany, 2010). This shows that the restrictions of the German organic certification are stricter than the restrictions of the EU. The stricter regulations do not only refer to the labeling of organic food as such but also to organic farming processes in Germany which communicate greater security in the production and the quality of organic food products (Federation of the Organic Food Industry, n.d., para. 6). German purchasers of organic food were found to consider ethical attributes such as animal welfare, regional production, faire prices and biodiversity significantly more than individuals from other European countries (Zander & Hamm, 2010). Worldwide market size for organic food has grown from 15.2 billion dollars in 1999 to 63.8 billion dollars in 2012 which has more than quadrupled (Willer & Lernoud, 2014). The worldwide organic cultural land has more than tripled from 11 million hectares in 1999 to 37.5 million hectares in 2012. In Europe, 11.2 billion hectares of agricultural land is managed organically by more than 320,000 farms whereby this represents 2.3 per cent of the overall agricultural land that is used in Europe (Willer & Lernoud, 2014). Spain, Italy, Germany and France have the largest agricultural terrains in Europe. The highest number of European organic farms is in Italy, followed by Austria, Spain, and Germany (Ecobank, 2000). Willer & Lernoud (2014) emphasized that updated data on the total organic area is available but not necessarily data on the number of farms or land used as countries do not report these figures. Switzerland, Denmark and Luxembourg have the highest per capita consumption of organic food, and in Denmark, Austria and Switzerland, organic food has the highest market share. The leading organic market in Europe is the German market with an estimated value of 7 billion euros, followed by France (4 billion euros) and the UK (1.95 billion euros) (Willer & Lernoud, 2014). Due to its continuous expansion, the topic of organic food has gained importance in the last decades and has become a field of interest for many researchers. Thereby not only motivations and barriers but also attitudes toward organic food, intentions to purchase, values, beliefs and norms have been investigated in order to find out more about the consumers’ decision making process and to choose implications for marketing activities. Barrena & Sánchez (2010) stated that quality has become the key marketing strategy; demonstrating individuals’ increasing concern for their own health and the environment. The role of marketing is to provide individuals with more information regarding organic food as they want “to be aware about how organic production and processing is indeed different from the conventional one and how organic products can be distinguished” (Zanoli & Naspetti, 2002, p. 652). Barrena & Sanchéz (2010) pointed out that a deeper understanding of the motivations of organic food purchase can help to develop marketing strategies which are adapted to purchasers’ needs and this can increase overall organic consumption. From a sustainable point of view, marketing activities should be a “process of creating, communicating, and delivering value to customers in such a way that both natural and human capital are preserved and enhanced throughout” (Martin & Schouten, 2012, p. 10). The sustainable marketing of organic food products can be understood as part of this process. Since the introduction of the national organic food label in Germany, between 2000 and 2005, organic food sales increased by 70 % in Germany and on average, between date 1 and date 2, 18 new labels of organic food were registered every day (Richter, 2007). In Germany, organic food is mostly sold via specialized organic food stores and farms whereas in most other European countries, organics are sold in conventional food shops (Hamm & Gronefeld, 2004). By now, German discount stores have introduced organic food products to their assortment (Gottschalk & Leistner, 2013) which also allows families with a lower income and individuals with migration background to consume organic products (Richter, 2007). Through the entrance of organic food products in discount stores such as Aldi or Lidl, organic food products are not seen exclusively as premium products anymore as they are comparable with conventional products with regard to price (Richter, 2007; Padilla Bravo et al., 2013). Despite the increase in organic food purchases during the last years and Germany’s position with the highest annual turnover of organic food products in Europe, the overall market share of organic food in Germany is still small with 3.9 % of the total food market (Schaack, 2013). The consumption of organic food in Germany is not as high as in other European countries with regard to consumption per capita (Willer & Lernoud, 2014). This shows that there is market potential and lot of research left in this field. A better understanding of the motives and barriers would allow further promotion of organic food purchase (Krömker & Matthies, 2008). By investigating individuals’ decision making process for organic food, conclusions can be drawn and marketing activities can be adapted accordingly. While many studies have pointed out health consciousness, food safety and sensory appeal as the main motives for purchasing organic food, others have stated that more altruistic reasons, such as the protection of the environment and the welfare of animals, determine purchasing behavior for organic food products. Still other studies have found both self-related and altruistic motivations to influence purchasing behavior. Health consciousness is related to individuals’ perception of organic food as food “without chemicals that is favorable to health” (Zagata, 2014, p. 248). Food safety is defined as the consumers’ concerns about the use of pesticides, “chemical […] fertilizers, artificial additives and preservatives” in farming and the residues remaining in the food (Michaelidou & Hassan, 2008, p. 164). Sensory appeal comprises the “taste, smell, appearance and overall quality” of organic food (Chen et al., 2014, p. 348). Becker et al. (2015) describe altruistic motivations of organic food purchase as the process of “building and maintaining of healthy soil and ecosystems” (p. 343). Honkanen, Verplanken & Olsen (2006) add that participants with altruistic motivations think that organic food is produced without hurting animals (p. 424). Previous studies have analyzed the motivations of organic food purchase and have found different results. For instance, Chinnici et al. (2002) used a sample of Sicilian inhabitants and conducted face-to-face interviews. A total of 552 subjects participated in the study and completed a survey. Their results showed that health was mentioned in more than 50 % of the cases when participants were asked to name the motivations for the choice of organic food products. Health consciousness is followed by curiosity and environmental concern as well as taste and nutritional content. The results of this study are demonstrated in Figure 1. Figure 1 Reasons for the choice of organic products. Reprinted from “A multivariate analysis on the consumers of organic products,” by Chinnici et al., 2002, British Food Journal, 104(3–5), 187. Copyright by MCB UP Limited. Magnusson et al. (2003) used a random nation-wide sample of 1,154 Swedish citizens. In their survey, the researchers concentrated on the buying rather than on the consumption and asked subjects about their purchase frequency, their attitudes toward organic food and their intention to buy, the importance of organically produced food, and the perceived availability of specific organic food products. In a second part, participants were asked about the perceived consequences of buying organic food in general. A multiple regression analysis revealed that, again, concern for one’s own or family health is the most important predictor of attitudes and purchase intention. Using open and closed-ended questions in a sample of 200 participants from the UK, McEachern & McClean (2002) aimed at identifying consumers’ perceptions, attitudes, knowledge and buying behavior. The researchers found a majority of egocentric motivations such as improved taste, food safety and health benefits as the top three. Zagata (2014) collected data from 32 regular organic buyers and created a hierarchical value map showing the most important attributes, consequences and values of the respondents. The results revealed that Czech participants mainly see organic food as food favorable for health. Paul & Rana (2012) conducted face-to-face interviews with an US sample including 301 participants and added a questionnaire with closed-ended questions to the interviews. The participants were asked about the main reasons for purchasing organic food and the majority of them stated that overall benefit, i.e. healthy content, environment friendly packaging and environment friendly technology are the benefits that they seek from organic food (Figure 2). An additional regression analysis revealed that health is the best predictor of organic food purchase, followed by availability and education, but also environmental protection, taste, quality and status in the society were found to be very important motivations of organic food purchase. Figure 2 Reasons for buying organic food. Reprinted from “Consumer behavior and purchase intention for organic food,” by Paul & Rana, 2012, Journal of Consumer Marketing, 29(6), 416. Copyright by Emerald Group Publishing Limited. Padel & Foster (2005) interviewed in total 96 participants from the UK in focus groups and summarized that purchasing behavior for organic food is mainly driven by health consciousness but also by social aspects such as the support of local farming. Subjects associate local farming with “feeling good” which shows that the association between organic food and local farming can lead to satisfaction (p. 618). Figure 3 visualizes the cognitive structure of motivations for buying organic fruit and vegetables. Figure 3 Cognitive structure of motivations for buying organic fruit and vegetables . Reprinted from “Exploring the gap between attitudes and behaviour,” by Padel & Foster, 2005, British Food Journal, 107(8), 612. Copyright by Emerald Group Publishing Limited. By interviewing 60 regular and occasional Italian consumers of organic food and applying the hard-laddering approach, Zanoli & Naspetti (2002) created maps which show that aspects linked to health and well-being occupy a central position in the cognitive structure in both groups of participants. Besides this, the researchers found that taste and nutritional content are also purchase motives that participants are attached to. A hierarchical value map regarding organic fruit and vegetables is presented in Figure 4. Chen et al. (2014) distributed questionnaires to a total sample of 935 Chinese participants in supermarkets in four major Chinese cities. After running a factor analysis, the researchers identified a high loading for the dimension “certification” representing the labeling of organic food as such. The researchers explained that recent food scandals in China have led to considerable confusion among Chinese and reduced the trust in overall organic food quality. Therefore, it is reasoned that Chinese are concerned about food safety and doubt the certification of organic food and its quality. Figure 4 Hierarchical value map of positive ladders of the regular consumers. Reprinted from “Consumer motivations in the purchase of organic food,” by Zanoli & Naspetti, 2002, British Food Journal, 104(8), 643. Copyright by MCB UP Limited. O’Donovan & McCarthy (2002) established a questionnaire and collected data on the purchase behavior for organic meat of 250 Irish subjects. The researchers reported food safety combined with health issues to be the main motivations of purchasing organic meat. Figure 5 demonstrates participants’ concerns regarding food safety. Figure 5 Food safety concerns among consumers – percent of respondents. Reprinted from “Irish consumer preference for organic meat,” by O’Donovan & McCarthy, 2002, British Food Journal, 104(3–5), 353. Copyright by MCP UP Limited. Michaelidou & Hassan (2008) collected the answers from 222 self-completion questionnaires of a Scottish convenience sample. It was then analyzed whether relationships between attitude, food safety concern, health consciousness, ethical self-identity and intention to buy exist. A regression analysis revealed that the variables health consciousness, food safety concern and ethical self-identity affect attitude toward organic food, yet the impact of health consciousness is smaller. The researchers also proved that attitude toward organic food and the variables food safety concern, health consciousness and ethical self-identity significantly impact the intention to buy. Yet, after controlling for the effects of attitude, their impact was not significantly different from zero. This finding suggests that attitude functions as a mediator between the variables health consciousness, food safety concern and ethical self-identity and intention to buy. On the basis of a sample of 1,154 participants from the Swedish national population register, Magnusson, Arvola, Koivisto Hursti, Aberg, & Sjödén (2001) collected answers regarding four different organically produced food products and asked questions about the attitudes toward organic food, the intention to buy, the importance of purchase criteria, purchase frequency, perceived availability of organic food and the importance of the price. The researchers showed that taste is considered as the most important criterion to buy organic food, followed by a long shelf-life and health consciousness. The attribute “organically produced” is seen as the least important motivation so that it can be inferred that organic food as a status symbol does not play a role here. The results of Chen et al. (2014) confirmed the previous finding by also citing sensory appeal such as the taste, but also the smell and the appearance of organic food to be important for the purchase decision. When purchasing food, Chinese people expect visual signs of quality. This shows that the sensory appeal of organic food may be related to the evaluation of its quality. In the study conducted by Becker et al. (2015), 250 Israeli organic and non-organic participants had to rank motives such as price, taste, health and environmental awareness on a 5-point scale of importance. The researchers then investigated motives that influence the decision to belong to the organic or non-organic group. Their study revealed that environmental awareness is a significant variable in deciding to become an organic consumer and that price and taste are the factors which determine how much organic food is purchased. Padilla Bravo et al. (2013) based their study on data gathered from a large sample of 13,074 responses from the German National Nutrition Survey II whereby the data consisted of the subjects’ buying frequency for 12 food groups. A factor analysis on purchasing motives clustered motives in four dimensions; healthiness, altruism, convenience and exclusiveness. The dimension of altruism describes the concern about environment and animal welfare, consumers’ political attitudes and social aspects which influence the demand for organic food. Convenience is defined as the availability and location of organic food related to search costs as well as packaging characteristics. Exclusiveness takes into consideration that consumers’ perception of organic food is to some extent comparable with the perception of regional and specialty food. This dimension is defined through a positive attitude toward this type of food and a higher willingness-to-pay. It was found that the dimension altruism constructed through the items animal welfare, eco-packaging, fair trade, GMO-free and seasonality is the most important motive affecting organic purchase behavior. Table 1 summarizes the presented findings of previous studies regarding motives of organic food purchase. Becker et al. (2015) found price to significantly but negatively influence purchase. Lee & Yun (2015) collected data from 725 surveys conducted in the US and measured the attributes nutritional content, natural content, ecological welfare, sensory appeal and price, but also attitudes and purchase intentions on a 7-point Likert scale. The researchers suggested that price perception is negatively related to attitudes toward organic food as well as to actual purchase. Besides Becker et al. (2015) and Lee & Yun (2015), Magnusson et al. (2001) reported that about half of their participants state that price is a barrier and in order to purchase organic food, more than half of the participants say that organic food must not be more expensive than conventional food. Even if individuals have favorable attitudes toward organic food, the higher price is a key deterrent (O’Donovan & McCarthy, 2002). By collecting data from 529 Flemish participants, Aertsens, Mondelaers, Verbeke, Buysse & Van Huylenbroeck (2011) identified high prices but also the lack of availability of organic food as key barriers. An overview of the mean ratings of the barriers for purchasing organic vegetables is presented in Figure 6. Figure 6 Barriers for buying organic vegetables (ordered by decreasing importance). Reprinted from “The influence of subjective and objective knowledge on attitude, motivations and consumption of organic food,” by Aertsens et al., 2011, British Food Journal, 113(11), 1364. Copyright by Emerald Group Publishing Limited. Paul & Rana (2012) reported that non-availability of organic food is cited as the major barrier in the purchase of organic food, followed by high price. Figure 7 presents the stated reasons for non-purchase of organic food. Figure 7 Reasons for non-purchase of organic food. Reprinted from “Consumer behavior and purchase intention for organic food,” by Paul & Rana, 2012, Journal of Consumer Marketing, 29(6), 416. Copyright by Emerald Group Publishing Limited. Based on the data of a Costa Rican sample of 480 participants, Aguirre (2007) emphasized that non-availability and a high price, but also appearance of organic food are the main reasons for not purchasing. The researcher pointed out the importance of “cosmetic defects” (p. 151). On the basis of personal interviews with 1,612 participants in eight Greek cities, Fotopoulos & Krystallis (2002) found price to be the second major barrier after non-availability. Davies, Titterington & Cochrane (1995) analyzed the results of three studies run in Northern Ireland between 1989 and 1993, comprising a total sample of 2,185 participants and identified likewise price and the lack of availability to inhibit purchase. Similarly, Zanoli & Naspetti (2002) argued that most of their subjects perceive organic food products as expensive and difficult to find, yet they judge them positively. The hierarchical value map of negative aspects is presented in Figure 8. Table 2 summarizes the presented findings of previous studies regarding barriers of organic food purchase. Figure 8 Hierarchical value map of negative ladders of the regular consumers. Reprinted from “Consumer motivations in the purchase of organic food,” by Zanoli & Naspetti, 2002, British Food Journal, 104(8), 643. Copyright by MCB UP Limited. In the context of organic food not only motivations and barriers play a role but also individuals’ socio-demographic profile can be related to their purchase behavior for organic food. Although researchers have agreed that more women than men buy organic food products, men were found to be willing to pay more for organic food than women (Ureña, Bernabéu & Olmeda, 2008) and to have better environmental knowledge than women (Kollmuss & Agyeman, 2002). Ureña et al. (2008) conducted face-to-face interviews with regular food shoppers in Spain and a sample of 464 participants was randomly selected. By calculating the odds-ratios of the differences in consumer willingness to pay for organic food between men and women, the researchers found that men’s willingness-to-pay for several tested organic products is significantly higher than that of women. In his study, Aguirre (2007) showed that 61 % of the participants state that the main buyer in their family is female. The researcher argued that women as primary buyers in a family are usually responsible for the family’s food shopping which may explain the higher number of women purchasing organic food. The findings regarding age are not consistent. Whereas some studies have revealed that older individuals are more likely to purchase organic food, other findings have shown that organic food purchasers are middle-aged and a larger part of studies have found organic food purchasers to be of younger age. On the basis of a Nielsen homescan dataset for 41,000 US households, Dettmann & Dimitri (2010) revealed that 49 % of the households which purchase organic food are older than 50 years. Similarly, Aguirre (2007) reported that the average age of organic purchasers is 46. Magnusson et al. (2001) discovered that young respondents between 18 and 25 years have a more positive attitude toward organic food products than respondents between 26 and 65 years. By running a regression analysis, the results of Onyango et al. (2007) revealed that female and young consumers who are aged between 18 and 32 years are more likely to purchase organic food products than male and middle-aged respondents who are between 33 and 51 years old. Older people tend to purchase organic food due to health reasons and younger people are more environmentally conscious, but have limited purchasing power (Fotopoulos & Krystallis, 2002). Several researchers have described the curve representing the relation of age and organic food consumption as U-shaped (Curl, Beresford, Hajat, Kaufman, Moore, Nettleton & Diez-Roux, 2013; Kriwy & Mecking, 2012) (Figure 9). Figure 9 Inverted u-shaped relation between age and the purchase of organic products. Reprinted from “Health and environmental consciousness, costs of behaviour and the purchase of organic food,” Kriwy & Mecking, 2012, International Journal of Consumer Studies, 36(1), 35. Copyright by Blackwell Publishing Ltd. Besides gender and age, children living in the household have been found to positively influence purchase behavior for organic food, whereby a family of three to four family members with two or less children has the greatest impact. In their third study, Davies et al. (1995) found that 44 % of purchasers who have a higher willingness-to-pay for organic food are in households with children, compared with 41 % who are living without children. Becker et al. (2015) reported that Israeli consumers of organic food have more children than non-consumers. Yet, on the basis of a multiple regression analysis, the variable children had a negative sign indicating that once participants start to buy organic food, the number of children has a negative impact on the quantity purchased. It has been found that an upper-mid level of income and education positively affect organic purchase behavior. Aguirre (2007) identified an average income per individual of 957.56$ for a Costa Rican sample of organic consumers. By creating four clusters of users of organic food, Fotopoulos & Krystallis (2002) revealed that the participants who are in the cluster with the highest income are less price sensitive toward organic food. Whereas in cluster 4, 11.3% earn more than 14,000$ monthly and 24.6 % state price as being the barrier to buying organic food, in cluster 1, only 1.8 % of the participants earn more than 14,000$ monthly and 43.7 % state price as being the barrier. Onyango et al. (2007) reported that participants with a college education or more are more likely to purchase organic food than those with only some college education. On the basis of 660 Greek participants, Tsakiridou, Boutsouki, Zotos & Mattas (2008) stated that demographics such as education, income, age, employment and household size seem to affect attitudes toward organic food, but with no impact on behavior. The researchers only found significant variations between the organic buyer and non-organic buyer group with respect to age and income, yet the differences in the mean values were minor. To describe individuals’ decision making process, Ajzen (1991) developed the theory of planned behavior. This theory consists of the idea that attitude, subjective norm and perceived behavioral control influence behavior through intention (Figure 10). Whereas several researchers have applied the theory of planned behavior to the decision making process of organic food purchase (Aertsens et al., 2009; Chen, 2007; Magnusson et al., 2001; Tarkiainen & Sundqvist, 2005), others have concentrated on the means-end chain method (Barrena & Sánchez, 2010; Zagata, 2014; Zanoli & Naspetti, 2002) to investigate individuals’ cognitive decision making process. The means-end chain framework focuses on the associations between the attributes of a product, the functional and psychological consequences of the attributes for the individual, and the personal values that the consequences reinforce (Zagata, 2014, p. 245). Still other researchers have simply differentiated between attitude and intention to buy and how these are stimulated by the motives for purchasing organic food. Çabuk, Tanrikulu & Gelibolu (2014) reported that attitude functions as a mediator between health consciousness, environmental concern and food safety, and intention to buy. On the basis of 385 self-administered questionnaires distributed in Turkey, Çabuk et al. (2014) drew the conclusion that a positive attitude toward organic food is likely to increase the probability of purchasing organic food. Figure 10 Theory of planned behavior. Reprinted from “The theory of planned behavior,” by Ajzen, 1991, Organizational Behavior and Human Decision Processes, 50(2), 182. Copyright by Academic Press. Inc.
Ajzen & Fishbein (1980) pointed out that a high correlation between attitude and behavior only exists if the attitude toward that particular behavior is considered. For instance, attitude toward climate change and driving behavior do not often show a correlation, meaning that even people who are very concerned about climate change tend to drive (Kollmuss & Agyeman, 2002). The researchers explained that “attitudes do not determine behavior directly; they rather influence behavioral intentions which in turn shape our actions” (p. 242). Kollmuss & Agyeman (2002) argued that people are rational, e.g. they make use of information and are not controlled by unconscious motives, yet intentions are not only influenced by attitudes but also by social norms. Newton and Meyer (2013) collected data on household resource consumption of 1,250 residents in Australia and stated that individuals are usually not behaving in a manner that is congruent with their stated attitudes and intentions. It was pointed out that barriers such as indifference, perception of no internal control, lack of information, convenience, lack of time and financial resources can explain the identified gap (Newton & Meyer, 2013). In the study of Magnusson et al. (2001), between 46 % and 67 % of the respondents agree that it is quite or very important to buy organically produced food, but only 10 % of the respondents state that it is very likely that they will choose organic food products the next time they buy food. Figure 11 visualizes at which points gaps between attitudes/intentions and actual behavior can occur. H1: Attitudes toward organic food are positively correlated with purchase intentions of organic food. H2: Attitudes toward organic food are positively correlated with purchase behavior for organic food. H3: Purchase intentions of organic food are positively correlated with purchase behavior for organic food. H4: Socio-demographic factors such as being female instead of being male, a higher level of education and of income, and an increasing number of children in the household are positively correlated with the purchase behavior for organic food. Increasing age is negatively correlated with purchase behavior for organic food. H5: Purchase intentions of organic food mediate the relationship between attitudes toward organic food and purchase behavior of organic food. Participants were informed and mainly recruited through social networks such as Facebook and in forums about organic food such as Naturkost (“natural foods”) and Bio/ Ökologie/Umweltschutz Forum (“organic/ecology/environment protection forum”). Due to the German language of the survey, it was ascertained that only German-speaking participants will answer the survey. The study was limited to the region of Germany due to the specificity of the cultural background which might influence purchase behavior for organic food. In total, 151 individuals answered the questionnaire, whereby the answers of 37 participants could not be counted due to insufficient completion. There were 3 participants who did not pass the first filter question and were excluded from the survey as they have never heard of the term “organic food products”. There were 5 other participants who did not classify any of the presented statements right and were not considered in the analysis of the data. Due to this elimination, there remained 106 complete questionnaires for the analysis. Table 3 shows the descriptive statistics of the socio-demographic variables. In total, there are 106 participants with 82 being female and 24 being male. Respondents are on average 26 years old (M = 26, SD = 6.26) with the youngest participant being 16 and the oldest participant being 57 years old. None of the participants state having no school degree at all and 79.24 % of the participants have less than 2,000€ per month at their disposal. A large majority of 92.45 % of the participants have no children at all living in their household (M = 0, SD = 0.45). Given that p = 0.08, and using α = 0.05, the variable Education does not deviate significantly from normality. The variables Age, Income and Children yield p -values lower than 0.05 and are therefore not normally distributed. The results of a Shapiro-Wilk test of normality can be seen in Table 4. A correlation analysis shows that only gender is significantly correlated with purchase frequency, r = -0.21, p < 0.05. This relationship will be investigated more precisely at a later point. Besides this, the male participants are on average older than the female participants, r = 0.24, p < 0.05. Age and income are positively correlated, r = 0.27, p < 0.01, and having children is negatively correlated with education, r = -0.20, p < 0.05. The described results can be seen in Table 5. These results seem to be logical due to the fact that older people are more likely to have a job and thus to earn more money. Additionally, people with children have less time to receive education and therefore have lower educational degrees than people without children. The small amount of participants with children reflects the relatively low average age of the participants. It should be noted that the confidence in these results is lower due to the probability in the form of the distribution. The survey started with a filter question which was created by Fotopoulos & Krystallis (2002) and was reused by Chen et al. (2014). 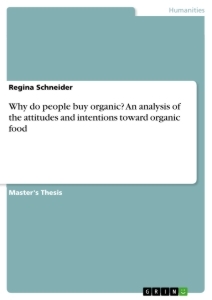 Whereas Fotopoulos & Krystallis (2002) established the filter question to distinguish between different types of users, here the filter question was used to ascertain that solely the answers of participants who are familiar with the concept of organic food were considered (Chen et al., 2014). The following part contained several statements concerning the definition of organic food and it had to be answered whether these statements are true or false. The binary variables were retrieved from Aertsens et al. (2011) and were used to filter those participants who classified none of the statements right. The main part of the survey contained items regarding participants’ attitudes and purchase intentions regarding motivations and barriers. Participants had to rate every statement on a 7-point Likert scale where 1 indicates strong disagreement and 7 indicates strong agreement as proposed by Chen (2007). There were 92 variables measuring positive attitudes, positive intentions, negative attitudes and negative intentions toward organic food regarding motivations as well as barriers. Whereas the items measuring attitudes toward organic food were retrieved from questionnaires used in previous studies, the items which measured intentions were developed for the purpose of this study. The structure of the questionnaire is depicted in Table 6. A measure for purchase frequency of organic food was likewise included into the questionnaire in order to explore the self-reported organic purchase behavior of the participants. Padilla Bravo et al. (2013) categorized individuals as regular organic purchasers with at least 10 organic purchases per year. Similarly to Padilla Bravo et al. (2013), Fotopoulos & Krystallis (2002) considered individuals who purchase organic food once per month as “aware organic users”. The question for measuring purchase frequency used in this survey was retrieved from Fotopoulos & Krystallis (2002). The last part consisted in the collection of socio-demographic data such as gender, age, education, monthly income and the number of children living in the household. The structure of this part was based on the questionnaire used by Nasir & Karakaya (2013). The complete questionnaire can be seen in Appendix A. The data was gathered through an online survey created with the program Qualtrics. Prior to the online publication of the questionnaire, a trial was conducted to estimate the time one would need to answer the complete questionnaire. This test revealed a processing time of 15 minutes. Afterwards, the questionnaire was translated into German and some minor changes had to be done regarding expressions which are different in the two languages. The orthography was checked by another German native speaker. After the upload, the survey was accessible online for one month; that is the month of April 2015. The participants accessed the survey on Qualtrics via a web link they were given with the announcement of the study. On the first page of the survey, the participants were informed about the topic, the approximate processing time and the anonymous treatment of their answers. After that, they were asked whether they have ever heard of the term “organic food” and had to specify whether the three presented statements are true or false. In the main part of the survey, the participants had to state to what extent they agree or disagree with the 92 statements regarding organic food. In the last part of the survey, they were asked to indicate their purchase behavior and to provide some information on their socio-demographic profile. On the last page of the survey, the participants were thanked for their participation and were given an e-mail address they could contact in case of questions regarding the survey. The statistical software package Stata version 12 was utilized to analyze the data. An English version of the survey can be accessed via https://qtrial2015az1.az1.qualtrics.com/SE/?SID =SV_02lEtp93sCGPL7v. N.F. Simpson's Play "A Resounding Tinkle" as a Satire on Suburbia - an Interpretation of Themes, Motifs, Figures, Attitudes, Language etc.